It took an hour and a half to disentangle a 10-year-old North Atlantic right whale that was spotted more than a week ago wrapped in fishing gear. It was spotted by the Grand Manan Whale and Seabird Research Station Sunday afternoon, and reported to Fisheries and Oceans Canada (DFO), and the Campobello Whale Rescue Team, which ended up disentangling the whale. Jerry Conway, who has been involved in whale disentanglement for four decades, said the team removed most of the gear from the whale. "We can't say that it was entirely disentangled, but we're quite optimistic that it has been," he said Monday morning. Conway said it's hard to know how far the whale had travelled from the area where it was originally spotted in last week. "This whale had been entangled for five days … so it could have been anywhere." 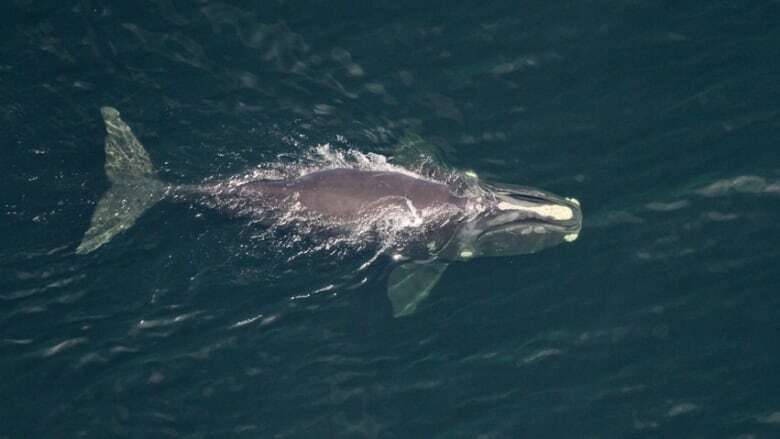 But according to Conway, the whale was spotted just off the coast of Grand Manan Island and it was not co-operative with the rescue team. "The crew had to approach the whale a couple of times," he said. "They had to use a flying grapple hook to hook into the line, and get the line caught up, and pull it as tight as they could and it was cut." Conway said they will count on fishing vessels, whale watching groups and those on the water to report if the whale becomes entangled again. He said the whale has distinct markings on its head called callosities. "It's a very distinct pattern. Each one is individual, it's like a fingerprint." He said that with the pictures provided of whale No. 3843, people should be able to identify it with those callosities, and alert the department and the team if the whale is in trouble. Conway said the fishing gear is now in the hands of the DFO. 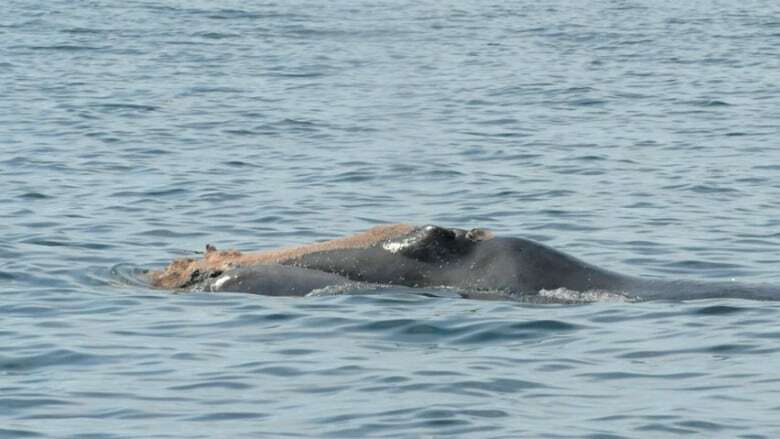 The whale was first reported east of Grand Manan Island dragging an orange buoy. DFO vessels, the Campobello Whale Rescue Team and the Canadian Coast Guard were all involved in searching for the whale. Conway said in a previous interview that the whale was of breeding age and is important to the survival of the species. North Atlantic right whales are endangered, with an estimated 450 left in the world. Of those, about 100 are breeding females, and so far this year, no calves have been spotted. At least 18 North Atlantic right whales have died in U.S. and Canadian waters since January 2017.